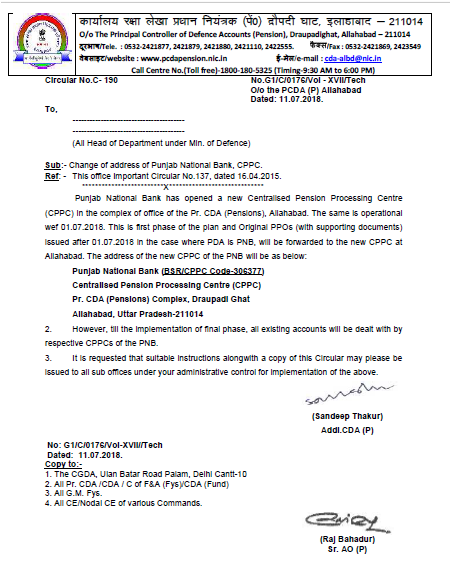 PCDA Circular C-190 – Now all existing accounts to deal with by respective CPPCs of the PNB. Sub:- Change of address of Punjab National Bank, CPPC. Ref: – This office Important Circular No.137, dated 16.04.2015. 2. However, till the implementation of final phase, all existing accounts will be dealt with by respective CPPCs of the PNB. 3. It is requested that suitable instructions alongwith a copy of this Circular may please be issued to all sub offices under your administrative control for implementation of the above.